When it comes to having the best aquarium, there are many things that go into the maintenance part. Some people would have the freshwater aquarium or the planted aquarium and not understand what it takes to maintain it. One thing that you can never forget is the maintenance of the aquarium water. As part of maintaining the water, you have to use water conditioner for the aquarium. This is because sometimes people even add tap water to the aquarium before treating it. So, what is the best aquarium water conditioner? We get to answer that question below with a list of the top performance water conditioners for your aquarium. In the end, you will have a safe environment for your aquatic life even the betta fish. Let us get right into it. Why Use Water Conditioner in Aquarium? What is the Best Aquarium Water Conditioner? How Does Aquarium Water Conditioner Work? When to Add Water Conditioner to the Aquarium? How Much Water Conditioner to Use in Fish Tank? How Often to Use Water Conditioner in the Aquarium? The water conditioners come in handy when it comes to treating the tap water so that it is safe for the fish to use. The conditioners will eliminate the chlorine commonly found in the water found in the tap. The chlorine as a chemical is good for keeping the bacteria and other microorganisms out so that you can use the water for human consumption. The same level of chlorine chemical that is safe for humans can easily be toxic and kill the fish in the aquarium. You have to use the water conditioner to help with eliminating the chlorine and chloramine that might be in the water. It is not just about removing the chlorine chemical, the water conditioner is also good for removing the heavy metals in the water. It is common to find such heavy metals in your tap water. It should also be great when it comes to removing the ammonia, nitrites, and nitrates in the water. As you can see, you always end up with clean water in the end. Depending on the water conditioner, it can also help with creating a slime coating important for protecting the fish. In general, you should have a safe environment for aquatic life. It is great starting with the Seachem Prime water conditioner as it is one of the best right now. 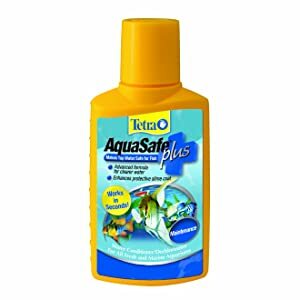 For most aquarists, they will love it for having top performance such as removing the chlorine and chloramine in the water. That is not all as the conditioner comes in handy for removing the heavy metals and other harmful toxins that might be in the water. The prime conditioner comes as a concentrated solution that you have to prepare for your aquarium. The preparation process is not hard. Just make sure to follow the instructions as given by the manufacturer to get things done correctly. The prime solution will further help with cutting down the nitrites and nitrates in the water. This is important to leave your water clean for the fish to survive easily. You also get that the solution remove the harmful chlorine and make it safer for the existence of the fish in the aquarium. This type conditioner can be great for the goldfish. When the immune system is down, the goldfish will tend to get sick often. Having the conditioner will help with treating the water to leave a clean environment for it. You will not even need a lot of the solution as it will always deliver on performance in small packages. Whichever type of fish you have in the aquarium, you can expect to enjoy the performance of the stress coat product. It will help with removing the chlorine component in the tap water and leave a safe environment for the fish. The solution further neutralizes the chloramine and detoxifies the harmful heavy metals that might be in the water. You can already see why this type of conditioner gets quite the love when it comes to using it for various cases. The water conditioner also helps with leveraging the natural healing abilities such as the Aloe Vera plant. The main aim is to provide a conducive environment for your fish to have an easy time healing if it was sick from contaminated water. This type of conditioner is still important when it comes to the production of the synthetic slime coat. The presence of the extra slime coat protection is important to help the fish fight off infections. You can always expect that you will have it easy when it comes to keeping your fish from getting the infections. If the fish is under stress, it has been shown that this product can help deal with it. It is possible for you to eliminate the stress by 40 percent. The best part is that preparing the solution for dealing with the water is easy. The manufacturer has a manual that you get to follow to get it done. The conditioner is in available in various bottle sizes. You can choose it depending on the size of aquarium. With its multiple applications, you should find it is great for your tank starting today. This is another top water conditioner that you should find it is great for your aquarium water. It will always deliver on the best performance at all times. The sixteen-ounce container is able to deliver on the best conditioning of the water even in the large tanks. It is important worth noting that the model is extremely concentrated. Well, this is because of the components that it has. You can imagine that a single ounce is enough to treat up to 600 gallons. With such concentration, you have to think about getting it properly mixed with your water in the tank. Luckily, the manufacturer sends you a detailed dosage guide whenever you buy this water conditioner. Follow the instructions in the manual and you should have no trouble cleaning the aquarium water. The solution will easily eliminate the chlorine and neutralize the chloramine found in the water. You will not have to worry that it might affect the performance of your fish. The best part should be that it can also detoxify the heavy metals in the tap water. With the heavy metals removed, you should have an easy time keeping the fish in such an environment. The solution will easily work for both the saltwater and freshwater tanks. You will not have to use different types of solutions if you own two different tanks. The conditioner is still safe for all the aquatic life you might think of. Another thing is that the conditioner is also safe for humans. This is great as now you will find some people using it for their shampoos after getting from the swimming pool. It can still be used to rinse the bathing suit. This is another top quality water conditioner that comes from a top brand. What is for sure is that you will always end up with top quality performance always. There is no doubt that seeing the name Tetra shows that it is a top performance product. With the brand aside, this is still a good conditioner. For those who have used it, they all agree that the working capabilities of the conditioner are great. 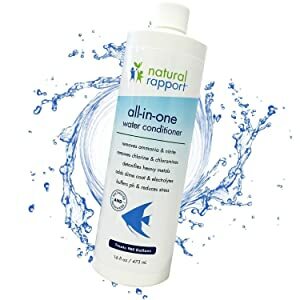 The conditioner works within seconds from the time it is applied to your water in the aquarium. So, what does it do exactly? With this type of water conditioner, you can expect it to neutralize the chlorine and chloramines in the tap water. Another great performance should be when it also removes the heavy metal. No more worries that the heavy metals will affect the fish in the aquarium. The conditioner is still great when it comes to providing the slime coat. This type of coat is important to help with healing the wounds of the fish from abrasion. It is not just about healing but also offer additional protection the fish deserves. AquaSafe has been part of the water conditioning market for over 35 years. It now means that the product you are getting is one of the best in the market. Over the years, the manufacturer has improved the product to make it the best for many people who want to use it now. This type of conditioner is good that it can be used for both freshwater and marine water too. Such versatility is what drives more people to think about getting it today for their aquariums. If you are unsure about setting it up for the aquarium, just make sure to follow what the manufacturer offers. The best part is that it is concentrated to deliver on the best treatment options. The 16.9-oz bottle is enough to treat up to 1,014 gallons of water. When it comes to using the water conditioners, sometimes you get confused about which to use as there are so many. By choosing this one, you get to eliminate the need for using the other types of conditioners. This is because it comes with a formula that does it all. You never have to worry about getting new conditioners each time for various activities. Some people would want to know in detail what the model can do. Well, it will work on removing the chlorine and chloramine commonly found in the tap water. Having the clean water free from such things will make it easy for the fish to survive in the aquarium. The solution is still good when it comes to removing the ammonia, nitrite, and the heavy metals also. As you can see, it is possible for you to easily remove the contaminants from the water using the conditioner. Having a safe and clean environment is great for the aquatic life to survive. If you did not know, the city tap water is not the best thing for your fish in the aquarium. 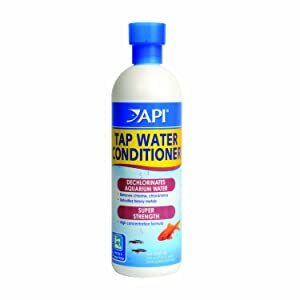 If you have to use the city tap water still, then you have to consider using such type of conditioner to make it safe for the fish. Without the conditioner, you might just end up with dead fish in the end. The best thing about this conditioner is that it will work for both the freshwater and saltwater. This is important so that you can always use the same conditioner if you these two different tanks in the same home. There might be many water conditioners out there, but not all of them will be great. Some even come with many additives that are just unnecessary. With this one, you get a top performance water conditioner that will simply work just as you would have wanted. The water conditioner comes with everything necessary needed for cleaning the tap water. The water can now be used for your aquarium from the moment the chlorine and chloramine have been removed. You can be sure that the water will be safe for your aquatic life. The conditioner is also important for restoring the slime coat of your fish. In the end, you should have a product that makes the slime coat for the fish so that it remains protected from the heavy metals and abrasions. Yes, the conditioner is still good when it comes to removing the heavy metals. These are the metals commonly found in the tap water at the moment. You can be sure that the fish will now in the safe environment. The solution is quite concentrated, so make sure you use it as the manufacturer recommends. One teaspoon is enough to treat up to 10 gallons. That just shows that you will not have to keep buying it for subsequent treatment of the aquarium water. The manufacturer offers you a comprehensive guide when it comes to the dosage. Follow the dose and you should have a clean and safe water environment for the fish. When it comes to picking the best aquarium water conditioner, it is all about having a model that can deliver on performance always. You do not want to pick one with too many additives that do not even deliver on performance. For the list above, you can always settle for the Seachem Prime as it is one of the best of the many available in the industry. The model will deliver exemplary performance for cleaning the water with ease. The impressive concentrated solution also cuts down the nitrites and nitrates you can find in the aquarium water. The water conditioner is important when it comes to cleaning of the water and make it safe for the fish. So, how does the water conditioner actually work? It is quite simple if you get to understand the chemistry behind it all. The conditioner will start by neutralizing the chlorine in the water. This is done through the formation of the ionic bonds and thus it will render the chlorine in the water to harmless components. Once this happens, the water should then be safe for the aquatic life. The same chemical process will happen when it comes to removing other components such as the chloramine and the heavy metals. There various times when you can add the water conditioner to the aquarium water. The first one is when you are setting up the new aquarium. You have to make sure that the water is prepared the correct way so that it can receive the new incoming fish. The other option would be when you are doing a water change. This is if you accidentally or had no option but to use the tap water. With the water conditioner, you should create the environment safe again for the fish. There is no easy way to answer this part, but it all depends on the water conditioner. There are those conditioners that might be too concentrated when it comes to using it for your tank. It is therefore important to follow the instructions given by the manufacturer. This makes sure that you only get to use the right amount depending on the size of your tank. The manufacturer will always send you the dosage instructions together with the product. Just because you see that it comes with many benefits, it does not mean that you have to use it daily. Most manufacturers recommend that you only get to use the water conditioner once a week when doing the water changes. Another time could be when setting up the aquarium for the first time. There is no doubt that you now know may be why your fish has been dying all along. You cannot just add tap water to the aquarium and expect the fish to survive. Now that you know more about the water conditioners, then you should be in a position to have one of the best products for your aquarium today. Each of the models reviewed above will give you the right performance that you deserve when it comes to treating the water. You can pick based on preference.